Three years ago Jan went to interview the top bods at Starbucks HQ in Switzerland and taste over 200 cups of their product..
Chris Jordan holds a silver spoon to his mouth and closes his eyes. Concentrate. Focus. Prepare. Outside, the morning sunshine glints on steely Lake Geneva; inside the Starbucks headquarters in Lausanne, another coffee-tasting session is about to begin. This is the centre of Starbucks's raw coffee world, where the green beans that provide the espressos and cappuccinos for their thousands of worldwide stores are sampled and bought. Today, more than 200 glasses filled with lukewarm, hand-roasted, freshly-ground black coffee are ranged around the cupping room, where Jordan and his colleagues will cup (taste) new coffees being offered by growers to Starbucks. As they purchase more than a million 60-kilo bags every year - a mountain, not a hill of beans - cupping is quite a responsibility. "We have to do it in the morning, when the palate is freshest and our focus is sharpest," says Jordan. Today, Starbucks is a huge international business, with over 7,000 stores in more than 30 countries and a workforce of nearly 75,000. Last month, the Seattle-based company announced record earnings for its third quarter, with worldwide consolidated net revenues of $1.3 billion. In the last 12 months, Starbucks opened 651 new stores across the world, selling what you and I might simply call cups of coffee - but what it prefers to describe as "hand-crafted beverages". From Ankara to Alaska, the company likes to boast about the ubiquitous availability of its grande lattes and espresso shots - just don't ask too many questions about its progress here in Britain. Oh, dear me, no. For, in doughty old Blighty, we are one of the very few countries to have bucked the successful global trend; instead, we have given a financial headache to the coffee giants that some describe as the ultimate corporate colonialists. Despite the fact that there are now 407 Starbucks outlets in this country, representing 25 per cent of the domestic coffee-shop market, Starbucks just can't seem to make it work in the UK - even though it is the market leader. Never mind the comfy, padded seats in the stores or the gingerbread biscotti or the frantically busy airport outlets or even the secret language that you have to master to order a Starbucks drink - a dry triple venti skinny cap with wings, please - the company has lost millions. The last available figures show that by September 2002, Starbucks had accumulated UK losses of over pounds 50 million since its launch here in 1998. Today, there is every indication that it is experiencing continued difficulty. Yet if you ask what's really going on, Starbucks executives refer you to corporate gobbledegook, such as: `Starbucks has been successful in its rapid growth internationally and we expect to post a consolidated profit this year, both including and excluding Canada. This significant financial milestone includes profitability for our businesses in Japan and in the United Kingdom." Huh? What milestone? Nobody can tell me. So why is business so difficult in the UK? "Don't ask us," Jordan shrugs. "We're just the guys who buy the coffee." Someone hands me a spoon and rolls a silver spittoon between my feet. It is suggested that I tie my hair back with a Starbucks hair band. I look at the yards and yards of coffee to be sampled, stretching like purgatory towards the far corner of the laboratory. Is now a good time to say that I hate Starbucks coffee? Perhaps not. "OK," says Jordan, who began his Starbucks career as a humble barista in an Oregon store 14 years ago and is now the company's coffee quality manager. His tastebuds are famously sharp. His nose is prominent. He is the green coffee bean equivalent of the man from Del Monte who says yes. Right now, he lifts a spoonful of coffee to his lips. "First, you gotta find your slurp. Some people whistle. I tried to whistle at first, but I choked. You can't taste anything if you are choking." As the olfactory section is at the back of your palate, the object of the exercise is to get the coffee back there almost in a gaseous, as opposed to a liquid, state. "My slurp," he says, "tends to be that I breathe in but breathe out of my nose at the same time. Like this." He slurps fast and hard from his spoon, making the most extraordinarily loud, soggy noise. Afterwards, instead of spitting forcefully into the spittoon, he lets the coffee fall from his mouth in dark brown rivulets, like a vampire who has gorged on too much blood. It's hard not to stare. Right behind him are two more colleagues: director Alain Poncelet (who trumpets like an elephant) and trader Colman Cuff (gun going off). In contrast, my slurp is pathetic. I sound like an old lady gumming her gravy. Pwwwhurp. On the samples in front of us, labels bear the names of their scorched, sun-beaten countries of origin: Rwanda, Peru, Salvador, Guatemala, Costa Rica, Ethiopia, Brazil, Mexico, Java. Starbucks has always prided itself on being a socially responsible company, committed to improving the lives of its coffee growers and pickers. In fact, Poncelet tells me, it only buys happy coffee - that is, coffee grown on farms and co-operatives where the workers are treated fairly. I nearly choke on my Mexican sample. How can they possibly police happiness? How can they really know? "We look at the faces of the workers when we arrive on the farms," says Poncelet. "We look to see if they are happy. We look to see if their faces are down." Coffee, happy or otherwise, grows almost exclusively between the Tropics of Cancer and Capricorn - the exact inverse of the world's wine-growing map. The mildest comes from Central America, progressing in terms of strength and boldness through Africa to potent, vein-bubbling Indonesia. As my new coffee friends slurp up and down the rows, they reveal, to a man, that they all like Ethiopian coffee best. Between slurps, they describe their findings to each other - using words such as fruity (that's bad), woody, juicy, bold, musky, burnt marshmallow, cedary, spicy and Band-Aidy. Band-Aidy? Nobody ever mentions the terms waxed-cuppy or burnt tongue or simply eeeugh, which is what I usually experience after purchasing a Starbucks coffee. I find their espresso bitter and weak, their lattes and cappuccinos tasteless and the Frappucino ™ too sweet. And don't get me started on their appalling sandwiches. Funnily enough, I do love a Starbucks skinny iced coffee with extra espresso shots in the summer - but then, I'm usually hot and desperate. And grinding some of their Christmas Blend beans at home produced a far superior brew to the one you can purchase in their shops. It's weird. Perhaps this is because they use more coffee per ounce of water than is the standard practice, or perhaps its because - and we all know this is true - coffee tastes better in a china cup than in a cardboard one. 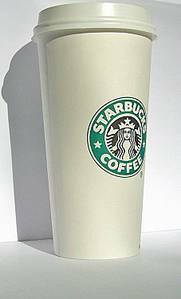 Starbucks uses only top-quality arabica beans, which grow at a higher altitude and are more expensive than the robusta beans that make most of the world's instant and canned coffee. And Starbucks does not add robusta beans to the mainly arabica blend - unlike many Italian-style espressos. But maybe that's it! Perhaps Europeans prefer the crema on top of the espresso that the cheap robusta provides. Who doesn't love the stuff that's served on autostrada service stations in Italy and in almost any little coffee bar there? France is different. The quality is, shall we say, variable. You never quite know what you're going to drink in Paris - although, since Starbucks opened a store on Avenue de l'Opera in January this year, what you can get is an extra hot whip grande latte if you are prepared to queue. The place is usually packed with French students pretending they are in an episode of Friends. Meanwhile, back down in the shallows of the UK coffee shop market, even when British consumers do buy a cup of coffee, we apparently have no brand loyalty. We are rubbish customers. If Coffee Republic is busy, we'll go to Caffe Nero instead. If there's a queue at Caffe Nero, Starbucks here we come. If the counter at Starbucks is too packed, we're off to Costa Coffee. We're just trying to grab a cup of caffeine on the way to work, for crissakes. Now get out of the way. Given this lax consumer behaviour, and the fact that customers are encouraged to add sugar, flavoured syrups and powdered spices to their drinks - and that the most expensive ingredient in a Starbucks cappuccino or latte is the milk, not the coffee - it's difficult to see why the experts in Switzerland go to so much trouble. But they do, tasting over 150,000 cups of coffee every year. "Because we are passionate about coffee," they say, as they whisk up and down the aisles. "We just love it." How do they do it? After about 100 cups, the inside of my mouth feels as if it has grown fur and the caffeine surges around my system in unpleasant pulses. "Slllurrrrppp. That's because you're not spitting properly," says Jordan, as more rusty blood drips from his fangs. What do they do after the cupping is finished? "We have a nice cup of Starbucks coffee," they chorus. But of course. Some of the coffees cupped here in the company's Swiss headquarters will eventually be used in house blends such as Starbucks Espresso Roast - or marketed by country of origin (Indonesian Komodo Dragon blend, Guatemala Antiqua, etc). After purchase, all Starbucks coffee is first shipped to the company's giant roasting plants in America or Amsterdam, where the beans will be processed into uniform blends that are mixed together to taste exactly the same, whether you purchase your drink in a shopping mall in Texas or at Tokyo airport. Starbucks are proud of this mass-market uniformity. Critics, however, suggest that they dark-roast their coffee, hence masking inconsistencies or variations between batches of beans. This, they claim, is what lies at the very core of the Bitter Dispute. "When you are in a Starbucks store and someone comes in, the most common word you hear about coffee is bitter," admits Jordan. "But the problem with the word bitter is that people generally don't know what they mean." Don't they just mean it tastes bitter? "Yes, but some people think that the acidity is bitter or the brightness is bitter. Some people think that the body is bitter. But I used to love it when customers said it was too bitter. I could explain it was not actually bitterness they were tasting - but I would give them alternatives until they found a coffee they liked. So `bitter' can be a way in. We think bitter is very positive. We like that." You do? Jordan, whose eyes gleam with the reverence of the true coffee geek, also insists that the biggest obligation Starbucks has in the UK is to educate the public, to "hold coffee seminars, to show the consumer what good coffee is all about". Apparently, after the indoctrination seminars, we floating customers, bitter tasters and unbelievers will, apparently, reach what Starbucks call "the point of no return". We will be undone. We will like the dark roast. We will drink the coffee. We will obey. We will obey. "Once you guys understand quality coffee like you understand wine, you won't ever change back," says Jordan - and the scary thing is that he means it, for this kind of goofy evangelism comes straight from the Starbucks top. Starbucks opened its first store in Seattle in 1971, and when New York businessman Howard Schultz got involved 11 years later, it was still only a local business with six stores and less than 100 employees. After being enthralled by the espresso bars he saw in Italy - and in particular the role of the barista, the person who actually makes the cup of coffee - Shultz saw the way forward. Since then, he has masterminded the massive global expansion of Starbucks retail operations, plus the production and American supermarket sale of bottled Frappuccino® and Starbucks DoubleShot ™ coffee drinks plus a line of Starbucks ice creams. Plans are under way to launch a Starbucks coffee liqueur, in association with the Jim Beam bourbon company. In his oddly emotional business manual Pour Your Heart Into It - How Starbucks Built a Company One Cup At A Time, Shultz insists that a company can grow big without "losing the passion and personality that built it". Can this be true? Certainly, the company logo - based on a 16th century Norse woodcut and depicting a siren who is supposed to be as seductive as the coffee - has remained the same, but not much else has. First, Starbucks sold simple bags of beans, then cups of coffee in small kiosks providing a quick "stand-up, to go" service that echoed the style of the espresso bars of Italy. Then, somewhere along the line, the company went all cosmic and soulful, seeing it as its duty to provide customers with what Schultz terms "The Third Place" - a place outside your home place and your work place where you could relax with friends or a friendly cup of coffee. Bigger stores were purchased. Comfy chairs and sofas were bought by the mile, newspapers were provided and, in some American stores, jazz bands were hired to play at weekends while the barista handcrafted your own personal beverage. It was a total experience, but one that doesn't seem to appeal so much in Britain. For a start, we've already got a Third Place that we all love: it's called the pub. Also, the high rents charged for the kind of prominent sites that Starbucks favours mean that the company has to sell rivers of coffee and mountains of muffins to come out with a profit - which it has failed to do in the six years it has been trading here. And now, everyone is trying to get in on the act. "Selling 11 grams of coffee and a shot of hot milk for £2 plus? Who wouldn't be tempted?' was how one entrepreneur put it. Today, nearly every department store seems to have a coffee shop - Marks & Spencer has 300 - while down on the high street, Starbucks, Costa Coffee, Caffe Nero, Benjies, McDonald's, Pret a Manger, independents and even Greggs all thrash around like ferrets in a sack to grab their share of a business expected to be worth £1 billion in the next few years. In the process, they have crowded into the same areas to chase consumers and fragmented the market. Despite the frightening costs, Starbucks keeps opening more and more UK stores, expanding exponentially and getting in deeper and deeper. Perhaps it believes that investment and critical mass will eventually solve its problems - and drive its competitors out of the marketplace into the bargain. In the meantime, Starbucks is finding the market in Japan a disaster and has pulled out of Israel. While its joint business partners in the rest of Europe carefully monitor the British situation, America thunders on unchallenged. Or does it? Certainly, Starbucks had a success in the US this summer, selling one million copies in its coffee shops of a Ray Charles duets CD, first released on its own Hear Music label, then later here in the UK. However, although Starbucks continues to thrive as the ultimate yuppie cuppa, there have been some recent signs of a slight retrenchment. In February this year, the comfiest chairs began vanishing from a few U.S. Starbucks outlets and instore newspapers are no longer free. Just like in Britain, you now have to pay for them. But the biggest change has been the instore equipment. Howard Schultz gets quite heart-rending on the subject of the Starbucks barista - "He becomes an artist when he prepares a beautiful cup of coffee" - yet in Starbucks outlets all over the world, the old manual La Mazzoli espresso machine is being replaced by the automated Versimo. It is quicker, of course, and all the barista really has to do is press a button. "Or stand behind the counter making shwiss-shwwoosh-shsissh noises," jokes one industry insider. Back in Lausanne, former barista Chris Jordan disagrees. "There is an element of automation, but the Versimo still makes a perfect shot," he insists. We're nearly at the end of our cupping. The noise in the room is deafening: a thundering waterfall of slurps and splashes. The coffee geeks are in their element, particularly when we get to the end of the last table, where a pile of beautifully packaged Starbucks coffee beans are awaiting perusal and admiration. "It is changing in Britain," Jordan insists, as he prods a shiny packet of Ethiopian Sedano. "What is happening now, especially as we roll into the festive season, is that British people go to lots of parties, they come into Starbucks for a coffee, they like it and they take a bag as a gift to their next party." Oh, Chris, I say. I don't know anyone in the whole country who would take a bag of coffee to a party. Champagne maybe. Beer or wine, yes. "That as well," says Jordan, nodding happily.